Earlier this month a 10 ft underwater kite began to produce electricity in a pilot project off the coast of Northern Ireland. The kite can produce more energy from lower velocity currents than almost any existing tidal technologies and the company developing the technology has plans for a 3- megawatt array in 2015. 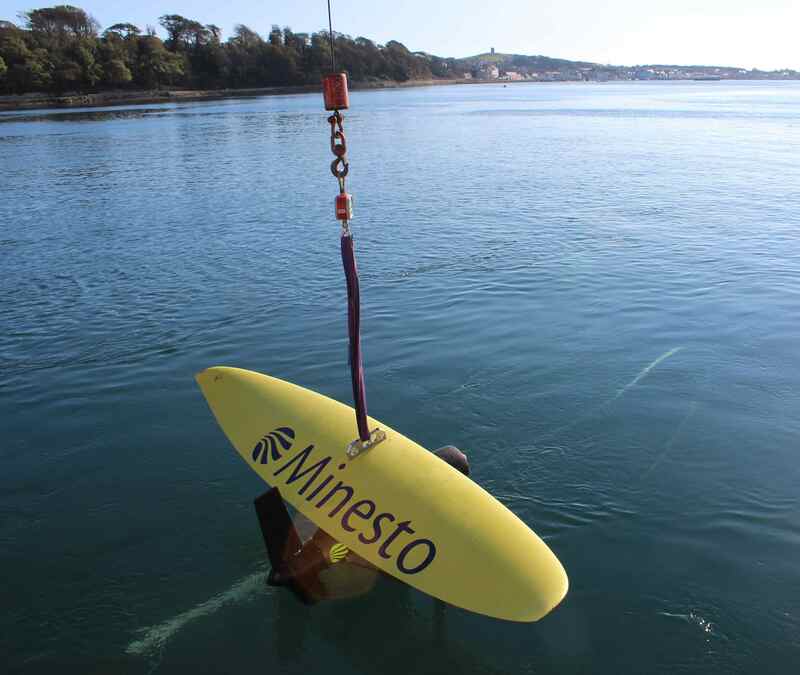 Minesto – is a Swedish-UK startup- is responsible for the development this new underwater kite appropriately called “Deep Green”. This marine marvel has its origins back in 2003 in the wind department at Saab Group in Sweden. As the project evolved it grew beyond its initial goals and Saab decided to form Minesto in 2007 to turn the idea into a commercial reality. The kite which is mounted to the ocean floor “lifts” by the force of the tidal current and controlled by its back rudder. This method can increase the flow speed of the water entering the turbine on the kite by up to ten times. As a result Deep Green can operate in areas where no other known technology can operate cost effectively to create energy from tidal power. The existing 10 foot Deep Green pilot kite currently operating in Northern Ireland is a scaled down version of the full size kite which could reach a size of up to 46 feet. 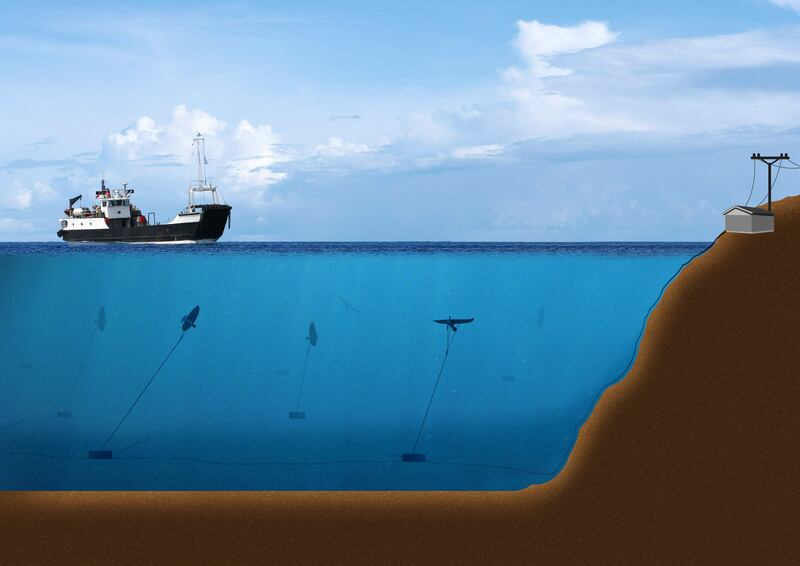 The kite which will be made from a strong and light carbon and connected with a strong wire of over 360 feet to the sea floor will weigh 22,000 pound and be located in a depth of around 330 feet underwater. After the pilot will prove itself, Minesto has plans for a larger commercial version to start producing up to 3 megawatt in 2015 and 10 megawatt in 2016. Since Deep Green operates in deep waters at low velocities it allows for a very large number of suitable sites. Deep Green has a robust anchorage system since no tower is needed for its operation. Deep Green has very low maintenance costs since only attachment and detachment has to be performed offshore. Deep Green has a minimal visual and environmental impact as it is always deep underwater. Deep Green relies on tidal currents which are predictable (much more than wind or solar which are effected by atmospheric conditions). Deep Green operate as a gearless turbine. You can find more information on Deep Green on the Minesto website. TFOT covered many developments concerning technologies used to generate energy from sea tides. In 2012 we covered the world’s largest tidal power plant built in Korea. At the same year we also covered Ocean Treader – hydro power attachment to offshore wind turbines in Scotland.